As you can see, this setup easily focuses down to about 1 in along the long dimension of the frame – good enough to capture even fairly small insects. The working distance increases considerably as the camera is focused on larger subjects, with the result that for large butterflies or dragonflies the working distance is several feet. You have to look closely in the image, but I use a bounce card on the flash (in this shot the flash’s built in bounce card is deployed, I usually use a larger one, assuming I remember to bring it with me.) The flash in actually positioned to discharge above the subject, which throws light behind it and helps illuminate near background elements. This also helps to hide the subject’s shadow, by placing the shadow behind the insect. The bounce card pushes some light down onto the subject that is both directional and diffuse – which helps soften contrast and shadow, but also helps bring out surface detail on the insect. The one component not shown in this shot is the monopod that I now regularly use for all insect photography. It’s just a lightweight SILK monopod – sufficient to jab into the ground and get a more steady shot with. This setup is essentially the same as the film based setup discussed in the earlier essay. But, going digital has introduced some changes that can’t be shown in a photo. • The excellent acutance of digital compared to film has resulted in my use of the monopod. It’s amazing that for years I got seemingly sharp shots on film just hand holding the camera. With digital, I get a ghost image if the camera isn’t rock steady – hence the monopod. • The lowest ISO setting for the *ist-D is ISO 200, and I routinely shoot at ISO 400 with no ill effect. There just isn’t noticeable digital noise until ISO 800 or higher. Combined with the enhance flash system – that now synchs at any speed up to 1/6000th of a second – its much easier to balance the ambient light with the flash and still maintain a high shutter speed to freeze the action and minimize the effects of hand holding the camera. I very often shoot at 1/500th or even 1/750th of a second, at f16, ISO 400. • The digital ‘crop factor’ results in more reach and more apparent magnification. The crop factor is the result of the digital sensor being smaller than the 35mm film frame it replaces. The 200mm lens on the *ist-D functions like a 300mm lens on a 35mm camera. The added reach and apparent magnification is nice, but the narrow angle of view, which allows better control over the background, is the real boon. That’s the basic rig that I use. Here’s how it is used in the field. Of course, the key thing is getting out into the field and finding the subjects. Insects can be unpredictable – at least for me – so its a good idea to scout out several locations, representing different types of terrain and habitat. If one place comes up dry, you can move on to another, different location and hopefully have better results. Unlike a lot of nature photography, you don’t have to be an early bird to get good insect shots. Different species are active at different times of the day. 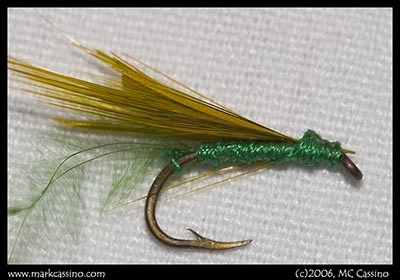 The morning can be a good time to get dew covered subjects – dragonflies, bees, or spider webs – but even on the hottest summer activity insects are active. In my experience, insect activity tends to peak from mid morning to early afternoon, and then drops off a bit during the hottest part of the day (though several species remain active even then.) Things then pick up again in late afternoon and early evening. As with virtually all photography, the lighting of the subject is what distinguishes a good shot from a great shot. • The ambient light needs to be balanced with the light from the flash. It’s important to realize that the insect is primarily lit by the flash – and that the flash is not being used only for fill. If you look closely at many of the insect photos – like this one: (Winged Wonder) You’ll see two highlights in the bug’s eyes. The top one is the sun, the bottom is the flash. I think that helps clarify how the two light sources interact. • I leave the flash set to no compensation, and manually set the camera’s meter to be one stop under exposed. When the background is far away, it will drop down a zone in exposure (the flash won’t illuminate it). The insect is lit at the correct exposure, and so it ‘pops’ a bit in the photo – it’s just a little brighter than the background. Here’s how this works out in practical terms: Lets saw the subject is a dragonfly lit by direct sunlight. The camera is set to ISO 400. The ‘sunny 16’ rule suggests that the correct exposure for the ambient light is 1/350th of a second at f 16. I often shoot at f16, for the depth of field. So in this case I’d set the camera to f16 and 1/750th of a second, and then rely on the flash to fully illuminate the insect in the image. The result is the “pop” effect mentioned above. This image is a good example of what I mean by that: Depth of field is a real challenge with any type of close up photography. Depth of field refers to the area that is in focus, or sharp, in an image. The more you magnify something, the less depth of field there is. The get more depth of field, the lens has to be stopped down. I routinely shoot at f 11 or even f16, depending on how big the subject is and how the background is working in the shot. However - stopping down too mcuh will degrade sharpness due to diffraction, so so if possible work at f8 to 11, f16 at a maximum. It's also important to regularly use the depth of field preview function on your camera to assess how the background will look in the final shot. While this won't tell you precisely what will be in focus, you can spot distractions in the background and correct them if possible. Controlling the background is another challenge. As with most photos, a clean and uncluttered background can really contribute to the quality of the shot. Of course, you can’t always control what kind of background you can get, but getting the right background can mean the difference between a strong aesthetic image and one that is just a specimen shot. The ideal background isn’t just a blank green blur, but also include some elements that contribute to the shot. Although the lens I use is manual focus, in a way I use autofocus for most of these shots. Pentax cameras support ‘tap focus’ with manual focus lens. In this mode, the lens is manually focused but the camera doesn’t fire until the autofocus sensor reads that things are in focus. With this technique you can just set the lens to the desired magnification and move in slowly, letting the shutter trip when the subject comes into focus. It doesn’t always work, and a quick flip to manual focus mode is often needed. I don’t use an autofocus setup, but I would expect a good autofocus setup to work well with insect close-ups. When it all comes together, it’s possible to get some interesting and even beautiful images of some of nature’s most interesting creatures. Aside from just straight close-ups of insects, shots that incorporate wild flowers or other elements can be the most compelling. 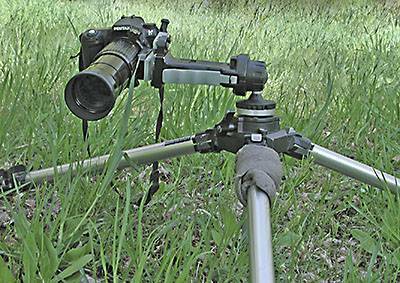 The setup I described above is what I use for shooting insect shots. But there are lots of other alternatives. For a person jest getting started with insect photography, deciding what lens to use is significant question. A macro lens is the obvious solution, but the drawback is that they are relatively expensive, especially in the 180 to 200mm focal length. A 100mm macro is also a very effective focal length, and on a digital SLR where the ‘crop factor’ is present, a 100 mm macro gives you a very good working range at a good price. This would definitely be an option worth considering . Under any circumstance, I would not recommend a 50mm macro for insects – there is just not enough working room. When selecting a macro lens, be sure to get one that focuses down to life sized – 1:1 magnification. 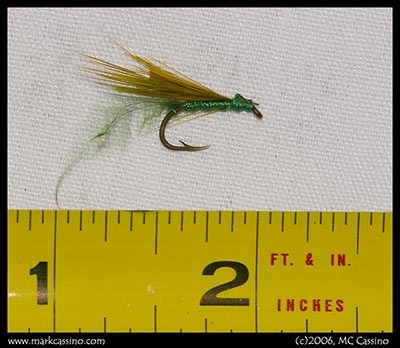 Some lenses only go to half life sized, and may not support shooting small subjects - like this fly. • Close-up diopters: These are like filters that screw onto the front of the lens and enable it to focus more closely. Inexpensive close-up filters are available, but generally will not meet stringent quality standards. High quality, multi-element close up filters are also available – but at a significant price point. One advantage of close up filters is that they don’t affect exposure – both extension tubes and teleconverters (discussed below) affect the amount of light reaching the camera. While this isn't a big deal - the camera meter sould adjust for the light loss - it does make it harder to balance the ambient light to the flash while maintaining a worakble shutter speed. Close up filters are the best choice for getting close with a zoom lens. • Teleconverters are a third option. Both close up filters and extension tubes have the drawback of not allowing the lens to focus to infinity, so you are locked into shooting close ups while they are in place. A teleconverter fits between the camera and lens, and basically magnifies the center of the image. They allow you to focus closer, while still letting you focus to infinity. The drawbacks of teleconverters is that they can be expensive and also impact exposure, similar to extension tubes. Because teleconverters are themselves another lens, adding one to your existing lens can introduce more optical distortions. 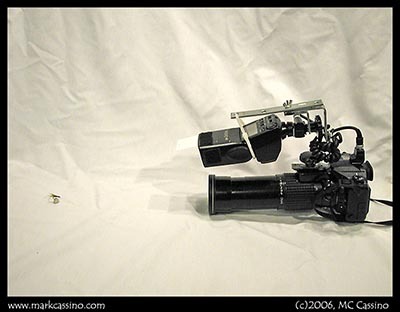 I use teleconverters specifically designed for use with my macro lens. Using a teleconverter designed for your lens is the best option. Otherwise, its something of a crap shoot in terms how a given converter will work with a particular lens. Once you have a lens that lets you get up close, the next step is to put together a flash bracket to work with it. There are few opportunities for constructing do-it-yourself photographic equipment. The macro flash bracket is one exception to this. You can buy macro flash brackets, modify standard brackets, or jus cobble together a bracket out of stuff from the hardware store. The bracket I use was make from a few corner braces and metal rods put together with simple nuts and bolts. That covers the basics of photographing insects. There are many ways to do it, and finding the way that works best for your gear and style of shooting is part of the fun. If you have any questions, feel free to email me. To see more photos, please visit the Insect Gallery or Dragonfly Gallery. A few weeks ago I posted a preliminary image from a new toy camera, found at the local Dollar Store. Since then I’ve taken another roll in the Special Moments Focus Free camera, and while most of the shots have been too underexposed to be a much use, I’ve been happy with a few of the images that have come out this camera. EB I94 is probably my favorite, taken while driving along the freeway during a pouring rainstorm. There’s just something about the line of water running off the wiper blade that appeals to me. Trillium field is another favorite from this batch. Obviously, it was taken while out shooting wildlfowers, and stands in a bit of a contrast to the straight forward, in focus, color digital shots from the same session. This camera displays the unusual characteristic of blurring light sources much more than shadows – which I guess makes some sense if you think about had a bad plastic lens would interact with bright light. For film I’ve been using Ilford SFX 200. This is a near-infrared film and was used for its epcial effects. Unfortunately, I bought an old, long expired lot off eBay over a year ago, and testing it out the IR effects seem to be gone. Last summer I used it as an ISO 200 B&W film, and it produce some fine images, though perhaps a bit on the grainy and contrasty side. But of the last several months the remaining rolls in this lot seem to have lost even more sensitivity, despite being stored in the deep freeze. Oddly enough, this old film fixes to be quite clear, and does not exhibit the fogging that you usually see with expired film. As with most toy cameras, it really is impossible to control the exposure. With only one shutter and aperture setting, there’s not much that you can do! Yesterday I set up the insect photography rig, and made my first serious insect shooting trip of the season. May is still a chilly time of year in Michigan, and even though a sunny afternoon can be downright balmy, it’s not uncommon to have frosts or even hard freezes, especially early in the month. This tends to hold the insect population at bay, but a few hardy insects still manage to venture forth during this time of year. I decided to visit the Allegan Forest for this trip. This is a big (80 square miles) sprawling natural area, set aside and managed primarily for hunting. It features an interesting mix of woodlands, oak savannas, open fields, water and wetlands. The habitat diversity, along with the sheer size of the area, offers a lot of opportunities for tracking down interesting insects. There are roughly a dozen areas that I visit, depending on the weather and time of year. For this trip I worked mostly areas near Swan Creek. I usually view the first few insect photography outings of the year as a sort of ‘spring training’ – a chance to get back in the groove and into practice. Insect photography can be extremely physically demanding. Positioning the camera and monopod low to the ground, in order to shoot upwards a bit in hopes of a clean background, means that you are constantly dropping to the ground (laying on the ground often) and then jumping back up on foot to chase the ever moving subject. Jumping up and down, crawling through fields to catch-up with the insect a few feet off, and moving quickly to frame up the shot and control exposure, makes for a fun but demanding afternoon. When I’m shooting insects, I try to get strong aesthetic shots, images that are really compelling and interesting at a design level. But I also take straight documentary shots – looking for images that document the existence of certain species of insects or behaviors. Of course, it’s a lot easier to snag the documentary shot vs the outstanding composition. Yesterday’ shooting was a mixed bag. I managed to get a couple of shots of an Olympia Marble, a somewhat rare butterfly (and one that seems to be diminishing in the natural world.) Had I known how rare it was, I probably would of tried for a few more shots. The two damselflies are the best of the day in terms of technical execution and composition. Identifying the subjects is another challenging aspect of insect photography. Birds and wildflowers can pose the occasional challenge, but ultimately they are pretty easy to sort out. However, with literally millions of species of insects, some with only slight variations between them, getting a reasonable ID can be a real challenge. When it comes to mis-identifying insects, I’ve made some major bloopers in the past (and will probably make more in the future.) Nonetheless, I keep a well stocked library of field guides, and have gotten a little basic training to help with the identification process. It’s important to try to match the subject to records that confirm its presence in the location where it was photographed. Unfortunately, most field guides give fairly general distribution maps, and even those that go down to the county level are not precise enough to ensure accuracy. For example, a couple of summers ago I was excited by what I thought were my first sightings of Karner Blue butterflies – only to discover that they are found only south of the Kalamazoo River, and I had been looking along the northern bank. So, getting a reasonable ID can be a significant challenge – for example, I’m reasonably certain that the butterfly shown below is a Wild Indigo Duskywing, but the distribution maps I consulted showed only “unconfirmed or unreliable sources” reporting it as being in Allegan County. Maybe my sighting joins the ranks of the unreliable, or maybe a few dots in the pattern on the wing point to a different species all together. But it’s an interesting an enjoyable exercise to work through the identification process. If you work the same areas for multiple years, you develop a feel for the natural rhythm and cycle of the locale, which is itself worthwile. Overall, I'm happy with the results of yesterdays shoot, and am looking foreward to the upcoming season. I really want to work at getting insect photography to the next level - and look at some of last seasons showts - shown below - as the starting point for this year's work. Technical details: all shots taken with Pentax ist-D and A* 200mm macro lens, AF 360FGZ flash in home made bracket, monopod. Yesterday I headed out to once again visited some favorite woods and forests in southwest Michigan, to capture some last shots of spring wildflowers. Driving out in the morning, I wondered if this was a good use of my time for the day. I honestly figured that this was the endgame for this year’s wildflower crop, and that I was likely to see nothing but a few faded trillium and wild geraniums. Happily, I was wrong. It had been almost a week since I had last been in the woods. The weather during that time was cold and wet, with a steady drizzle falling for a couple of days. On Thursday the sky cleared and temperatures warmed. The canopy of mature trees was finally emerging, and the result was that little light made it to the forest floor. This was confirmed by the camera’s light meter, and I found that the diffuser was left in the bag more often than it was used. Where I had expect to see thin, old, and faded flowers, I instead found a carpet of trillium, wild ginseng, skunk cabbage, and the green leaves left behind by other species of flowers. Granted, spring beauty was now all but gone in most places, and the remaining anemones were just a shadow of their former glory, but blue eyed Mary were still out in abundance, and wild geranium had also appeared. This spring, a new species of wildflower seems to have emerged just in time for each trip into the woods. On this trip Nodding Trillium made it’s appearance. Locally, nodding trillium is a more rare species than the Large Flowered Trillium and Red Trillium that dominate the landscape. It emerges later than the others, and can be somewhat difficult to photograph as its smaller flower droops or nods down below the leaves. Overall, I spent the time photographing close ups of the wildflowers and also photographing the forest floor and spring woods. I hoped to capture the feel of the sunlight filtering through the foliage. I broke my own rules, and shot the landscapes using the digital Pentax *ist-D. Medium format would have produced better results, but ultimately the camera at hand was the one I used. I looked at a lot of Trillium as I wandered through the woods. I looked carefully for a four parted Quadrillium, like the one I saw last week. Though I must of eyeballed hundreds of flowers, I didn’t see any other four petalled Trilliums. So maybe it is pretty rare after all. All shots taken with Pentax *ist-D. Close-ups taken with SMC A* 200mm macro, other shots taken with SMC FA 20-35mm f4. A while back I wrote about the Holga camera, and the interesting and unique shots that this inexpensive camera can produce. Inspired by the softness of the Holga, I’ve been trying out other bad cameras, in hopes of finding other silk purses amid the sow’s ears. Inspiration for this comes, of course, from JunkStoreCameras.com, the ultimate on-line resource for all your junk camera needs. I’ve bought and experimented with a variety of junk cameras, and have always come back to the Holga. With the exception of the Ricoflex ModelIV - which has a certain sweet patina to it - most 'junk' cameras that I’ve tried have been, well, too good. They may be soft and unsharp by modern standards, but in reality they produce some pretty good images. Others are decidedly not sharp, but produce images that lack any kind of character. One nice aspect of the Holga is the combination of a sharp ‘sweet spot’ with overall blurred and distorted edges. So you can image my surprise at finding a good junk camera, and at the dollar store to boot. Here’s a shot of the graveyard down the way, taken on a $1 “Special Moments” 35mm camera. This is a ‘focus free’ model, with one aperture and shutter speed. The film used was Orwo Pan ISO 125, pushed two stops. The camera certainly lives up to the 'focus free' designation! I’m pretty happy with the preliminary results – and with a freezer full of 35mm B&W film, I can find ample uses for this new addition to the camera collection. I started writing these essays just over three weeks ago – its hard to believe how much the seasons have changed in such a short time. Venturing out yesterday I realized that the forest has been transformed. The canopy is emerging, and the once bare undergrowth is now lush green. The wildflowers have continued to change as well. The once ubiquitous Spring Beauty is in retreat. It’s still plentiful and common, but the huge patches of it that covered the forest floor just days ago are now gone. Only small clumps or individual flowers linger on. The False Rue Anemone and white Trillium continue to thrive, but they have clearly reached their peak and have begun to fade. Now its the endgame, and the later species of flowers are emerging – bellwort, wild ginger, red trillium, and wild marigold are now out in abundance. Friday’s trip into the woods brought the chance to photograph many of these species. It also brought a real treat, in the form of a Quadrillium – a Trillium with four petals and four leaves. These are said to be fiarly rare – perhaps as rare as four leafed clovers. This is the second time I’ve seen one, the first time being two year ago. Ironically, as I was hiking out of the woods I thought to myself that finding a four petaled trillium would be the perfect end to the day – and a few minutes later I noticed one right by the side of the path. A perfect end to a morning’s shooting. Technical details: All shots taken with Pentax *ist-D, A* 200 f4 macro lens. Note: Updated February 7, 2015. Added notes about live view, focus peaking and articulated LCD screens. Respect the subject: Some wildflowers are endangered species, and virtually all woodland wildflowers are suffering from a loss of habitat and encroachment from invasive species. So I never uproot or relocate the subjects, or disrupt the flowers around them, even if they are annoyingly in the way. It's also important o watch where you step to avoid crushing those plants not part of your shot. Control the lighting: The quality of lighting is crucial for virtually all photographs. Direct sunlight will usually be too harsh (too much contrast) for high quality shots. I usually use a translucent diffuser to soften the light. In addition, a reflector can be used to bounce light back onto the flower, usually at a low angle. The bounce light brings out the textures in the flower, and make the lighting more lively. Of course – don’t overlook filtered natural light. Most woodland wildflowers thrive under the soft light filtered by the emerging leaves in the forest canopy above. If the trees are doing the diffusing for you – no need to use the diffuser! I use the nice ‘pop open’ style Lumiquest diffuser and reflectors. These are nice because they fold up to be quite compact, but you can easily make do-it-yourself lighting aids. For years I used a white umbrella as a diffuser and an 8x10 inch white card for a reflector. The diffuser does have to be fairly large, because you need even lighting throughout the frame, but the reflector can be quite small since you just need to illuminate the subject, usually a small flower. The combination of stopping down a bit, and also using softer diffused natural lighting, means that shutter speeds can get pretty low - too low to for hand held shots. As a result it’s important to mount the camera on a tripod. I the past I used a Bogen 3021 and grip action ball head, shown here. The tripod goes down pretty low, and the grip action head makes it easy to quickly position the camera and lens. I am currently using a newer setup with a side mounting support bar that lets the camera hover right at ground level. Another option is to carry a bean bag type support and just set the camera low to the ground.While there is not right or wrong angle of view to take on the flower, getting low to the ground can create more interesting compositions. The woodland wildflowers that I photograph in the spring are just inches tall, so getting low when photographing them means getting the camera just a few inches above ground level. Lens Choice: A 100mm macro lens that can focus to full life sized magnification is ideal for photographing small woodland wildflowers. A 50mm macro can also work very well, and in tight spaces the closer working room of the shorter lens can be useful. Except for the very smallest of wildflowers I find that I usually shot at 1/2 life sized or greater. So a zoom lens with a macro focusing mode that lets you get that close, or near to it, may work well. The definition of "macro mode" for zooms is rather loose so if you are purchasing a lens and want to photograph small wildflowers, see how close your can really get. 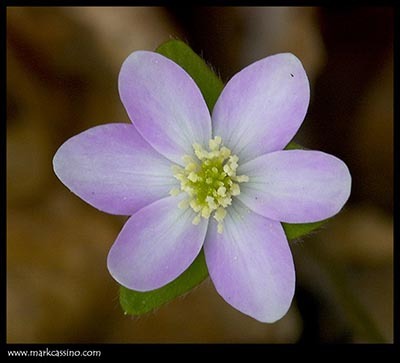 If you can fill half the screen or so with a dime, the lens should be OK for hepatica and other smaller flowers. I personally use a 200mm macro lens, which is capable of focusing down to full life-sized. The lens is able to focus in on flower that is smaller than a dime, and still fill the frame with the image. It also affords a lot of working room – distance between the camera and the flower. That’s useful, particularly when it comes to controlling the lighting – if the camera is right on top of the subject, it’s difficult to control how the light hits the flower. Live view, focus peeking and articulated LCD's: Without a doubt, one of the best aids to wildflower photography is the ability to use live view to compose on the camera's LCD screen. While compact cameras have always had this feature, older DSLRs (and all film SLRs) lacked it. When the camera is mounted low to the ground, often in muddy conditions and tight working space, it can be difficult to compose looking through the finder. Composing on screen and using focus peaking to see exactly where the focal plane is greatly simplifies this task. Using depth of field preview with focus peaking gives a very accurate sense of what will and will not be sharp in the final exposure. And while my cameras do not have articulated LCD's, there's also no doubt that this feature would be beneficial when shooting in the field. I think that sums up the basics of shooting wildflowers. Above all else, finding the flowers and being in the right place at the right time, is the key factor. Especially given how quickly the flowers come and go! Once again today I ventured out to photograph the local spring wildflowers. As mentioned in past posts, conditions change quickly, and from day to day different species of wild flowers appear and disappear. As the season unfolds the forest floor becomes more lush and green than ever – wild garlic, trillium, and anemones literally blanket the ground. A few new plants have emerged – wild ginger, bell wort, squirrel corn, and Canada Violet, to name a few. 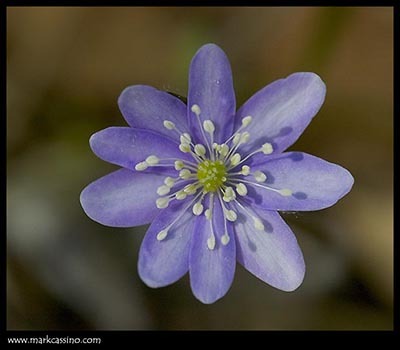 Hepatica – both blue and white – is now virtually gone. I saw two or three late bloomers, and lots of their foliage storing up energy for next year’s blooms. Trout Lilly is also fading fast – with only one or blooming plants to be found (though some areas of the forest floor are still covered with their patterned leaves. Even the spring beauty, which carpeted the ground last week, has thinned noticeably. One flower that is noticeably absent is Jack In The Pulpit. I realized this morning that I have not seen a single one of these flowers this year, so devoted some time to looking for it. These flowers are pale green and tend to blend into the ground, so I expected that I had just overlooked them. Unfortunately, I found only one Jack this afternoon, and it was withered and weak looking. Maybe its been a bad year for Jack in the Pulpit, maybe the deer got them early. At any rate, it’s one plant that has eluded me yet this spring. Lastly, the riot of trillium has definitely started to fade. So I’ll leave this post with an image of a faded trillium bloom from this afternoon.